Savory Oatmeal with Egg, Asian-Inspired Spicy Oatmeal, Mexican Oatmeal & MORE! There’s something SO comforting about sitting down to eat a hearty bowl of warm oatmeal. But, why do we limit ourselves to the same, boring oats routine: sweet, cinnamon-y, and topped with fruit? Fall in love with oats again by enjoying them in a new way—with these simple savory oatmeal recipes! Even though oats can be a super convenient and satisfying breakfast, we’re bound to get bored without some variety. Or, maybe you’re not a huge fan of the classic sweet oatmeal in the first place, it’s just an easy healthy breakfast option to make. Whatever the case, and whatever you thought you knew about oats, these savory oatmeal recipes will take your healthy breakfast game to a whole new level! Sure, if you’ve never eaten oatmeal with an egg on it, or spicy oatmeal, or Mexican oatmeal topped with taco fixin’s…these recipes might feel like uncharted territory. But, most of these recipes are a fusion between a bowl of oatmeal and a classic savory dish that you’re probably already familiar with (and that’s widely agreed upon as delicious). Plus, that newness can lead to excitement and genuine enjoyment of healthy foods. So, keep an open mind! 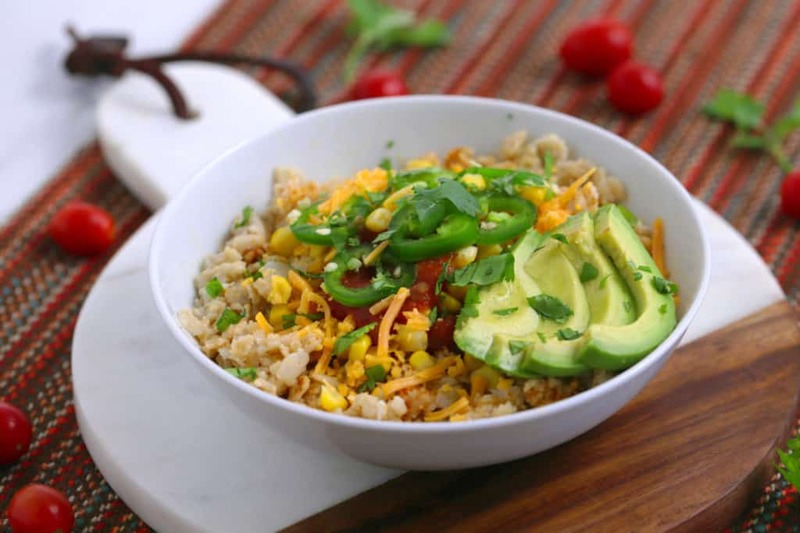 Honestly, if you like burrito or Buddha bowls, think of the oats like rice or quinoa. It’s like enjoying a satisfying, savory breakfast on top of a hearty, fluffy bowl of warm grains. And, you can enjoy a bowl of savory oatmeal for lunch or dinner, too—not just breakfast! Let’s demystify the ‘strange and unfamiliar’ savory oatmeal for a second: it’s still just oatmeal. 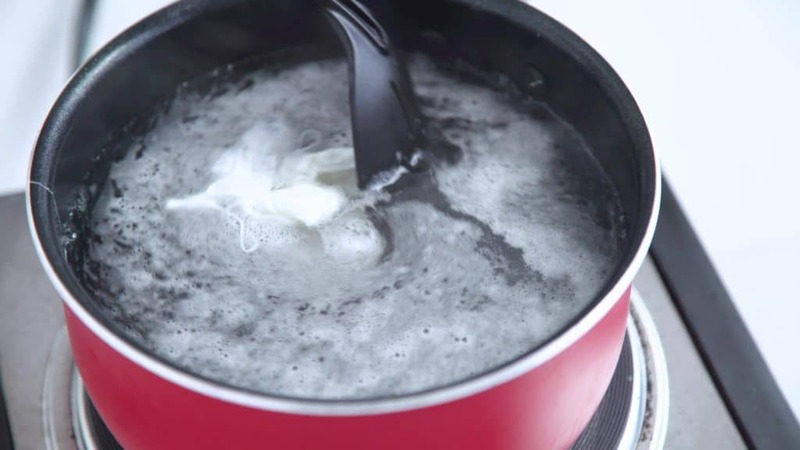 You literally cook it just like you would any batch of oatmeal on the stovetop—except with broth instead of water/milk, and with some garlic and onion added in for flavor. But, you can totally skip the garlic and onion, or use whichever savory flavorings you like! There’s no culinary rule that says oatmeal MUST be a sweet dish served with fruit and nuts. Most of us have just learned to eat it that way because that’s the norm in our culture. But, oats are just a grain. And, we actually enjoy most grains—like rice, quinoa, barley, etc.—in savory dishes. Because grains are great flavor sponges! So why not oats? With savory oats, there’s no need to add any sugar or sweeteners to the oatmeal, or to drizzle honey or maple syrup on top! Cutting that added sugar or questionable sweeteners out of breakfast time will help you stay full longer, keep your blood sugar stable, and gut healthy. Most of us struggle to eat enough veggies at all times of day. 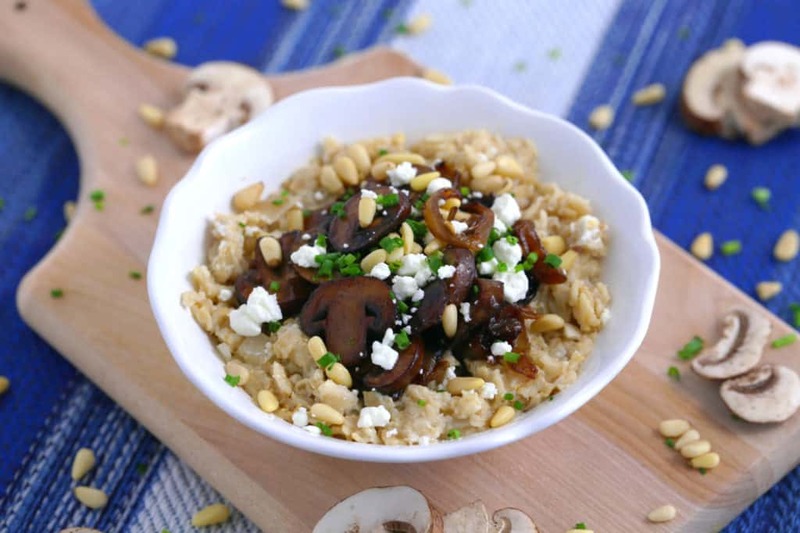 But, savory oatmeal is the perfect vessel to make vegetables more enticing at breakfast time! Omelets and frittatas aren’t the only options to pack veggies into breakfast. You’ll find onions, mushrooms, butternut squash, green peas, and even sauteéd spinach in the recipes below, but really any veggies can work. Just choose vegetables you like to eat, and serve them with flavorings you enjoy! Like other whole grains, oats do contain some protein—but only around 5g per 1 cup cooked. Mainly, oats are rich in complex carbohydrates, which can be a great source of slow-digesting fuel to power you through the morning. But, with sweet oatmeal, we tend to balance those carbs with more carbs from the fruit (and added sugars). Not to say that carbs are ‘bad’ in any way, but that our bodies need a balance of macronutrients: carbohydrates, fat, and protein. And a sprinkle of nuts on top of your oatmeal isn’t going to suffice in the fat and protein department. That’s one advantage that savory oatmeal has over sweet—way more options for nutritious protein and fat sources! Whether it’s eggs, sausage, bacon, cheese, or protein-rich veggies, there are loads of possibilities to pack more fuel into a bowl of savory oatmeal. Your body will appreciate the nutrients, and the protein and fat will help to keep you full longer! You can change up the fruits and toppings on your sweet oatmeal, but there’s a much narrower range of flavor possibilities. With savory oatmeal, you can explore different flavorings in your base batch of oats to bring some variety there. 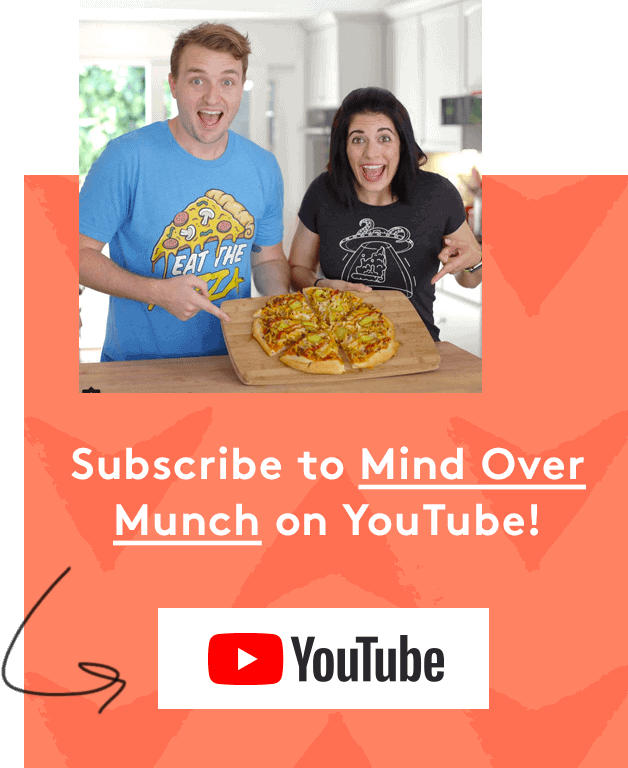 Plus, your topping options are literally ENDLESS! Really, you can transform any savory breakfast or meal that you enjoy into a savory oats recipe with a little creativity. For example, my B.L.A.T. 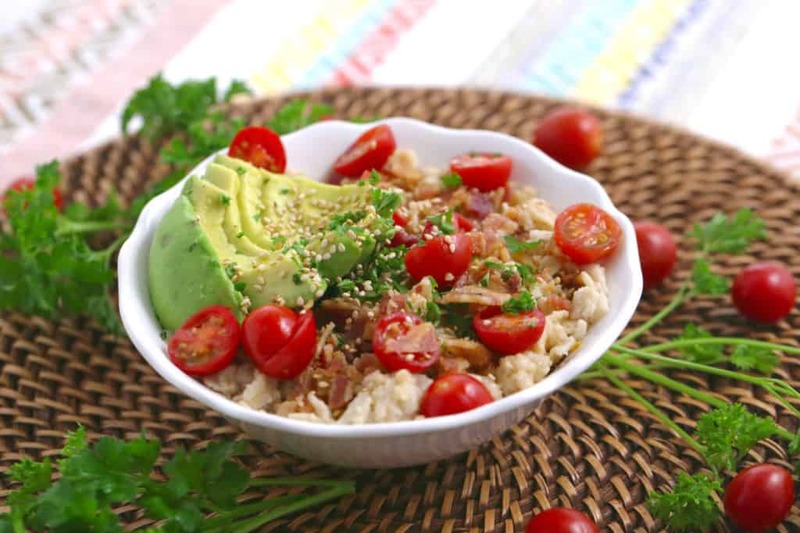 Savory Oatmeal recipe was inspired by a BLT sandwich with avocado (hence, ‘BLAT’). 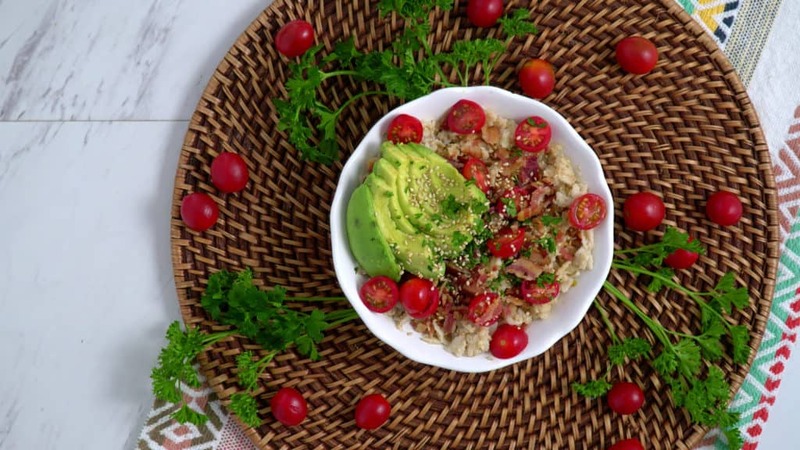 But, I just ditched the lettuce and bread, then served the bacon, avocado, and tomato on savory oatmeal instead! I used a sausage, egg & cheese breakfast as inspiration for one bowl, tacos inspired another bowl—there are no rules here. I’ve got a basic savory oatmeal recipe for you, along with 8 deliciously different topping and mix-in combos to keep things interesting! There are protein-packed bowls & veggie-licious bowls, spicy bowls & savory-sweet bowls, as well as vegetarian & some vegan savory oatmeal options. 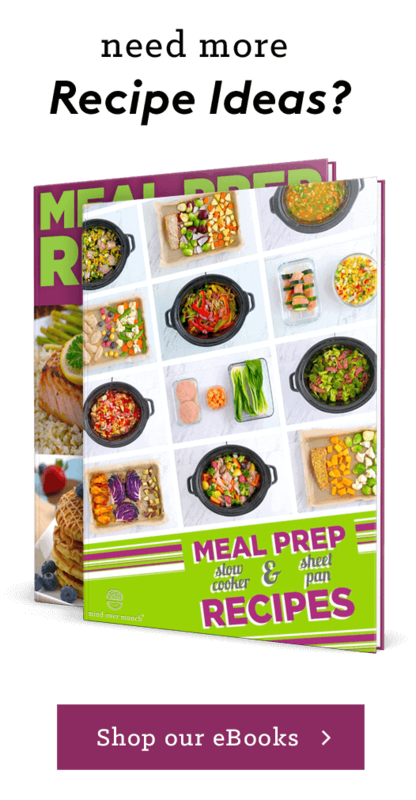 Of course, you can adjust these recipes however you like, substituting for or omitting ingredients as needed to suit your lifestyle and taste buds. And, feel free to use the simple base recipe with whichever savory flavors and toppings that you enjoy! 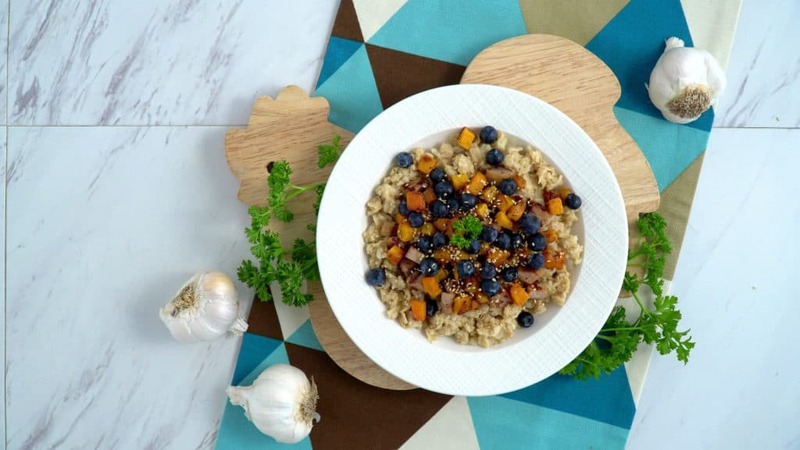 Why not get creative and craft YOUR ultimate batch of savory oats? 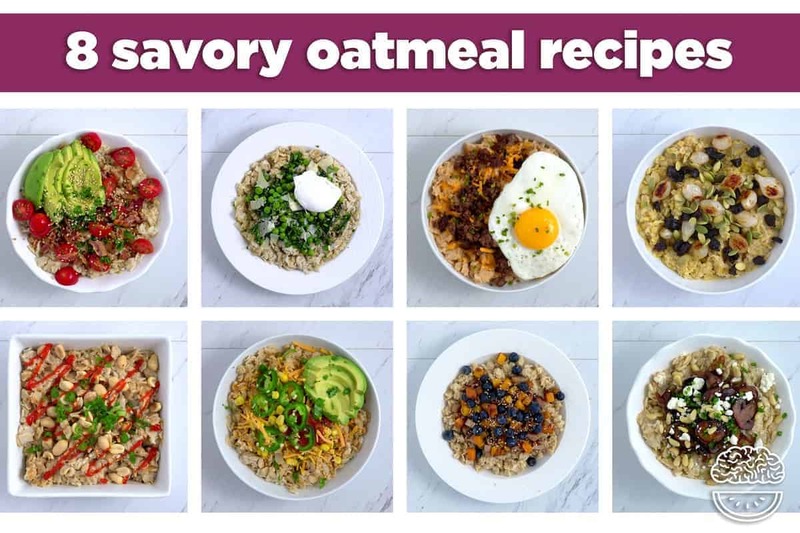 And, if you’d like to keep all of these savory oatmeal recipes in one convenient place for easy access, you can download my FREE Savory Oats Recipes eBook! Who says oats have to be sweet?! Like any grain, oats will soak up all of the delicious flavors of whatever you cook them with. 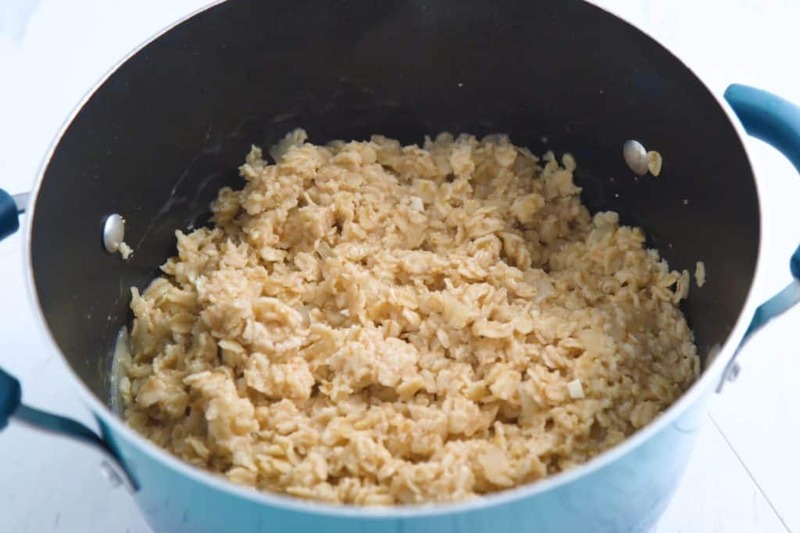 This basic savory oatmeal recipe is just as simple as making regular oatmeal—except using broth instead of water, and with added onions and garlic for flavor! For base recipe & all savory oatmeal recipes, use certified gluten free oats for 100% gluten free. 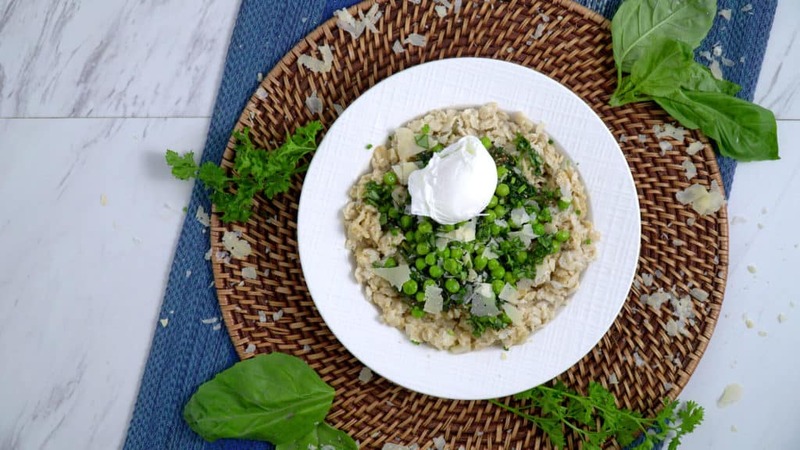 Just like cooking regular oatmeal over the stove, but with a simple, savory twist! *Use certified gluten free oats for 100% gluten free. Optional: In a pot over medium-high heat, drizzle oil and sauté onions and garlic until tender. Pour broth (or broth diluted with water, instead of just water) into pot and add salt. Cover and bring to a boil. Remove from heat, cover, and let sit for 2-3 more minutes. Yields ~8 cups cooked savory oatmeal. Add avocado to a traditional BLT, and you’ve got a ‘BLAT’ sandwich. Ditch the lettuce and swap out the bread for a bowl of savory oatmeal, and you’ve got a deliciously different breakfast! (Or, why not oatmeal for lunch?) Warm and comforting, fun and flavorful, and filled with wholesome fuel! Cook bacon and prepare other toppings. Add all toppings to savory oatmeal base. Pack more greens into your morning—with a veggie-packed oatmeal breakfast?! Between the sautéed spinach, green peas, and fresh herbs, this savory delight is gushing with greenness and superfood nutrients. Serve with a poached egg for a protein boost and loads of yolky goodness! In a pan over medium-high heat, drizzle a bit of oil and sauté spinach with Dijon mustard, until tender and wilted. Add sautéed spinach to savory oatmeal base, along with remaining toppings. 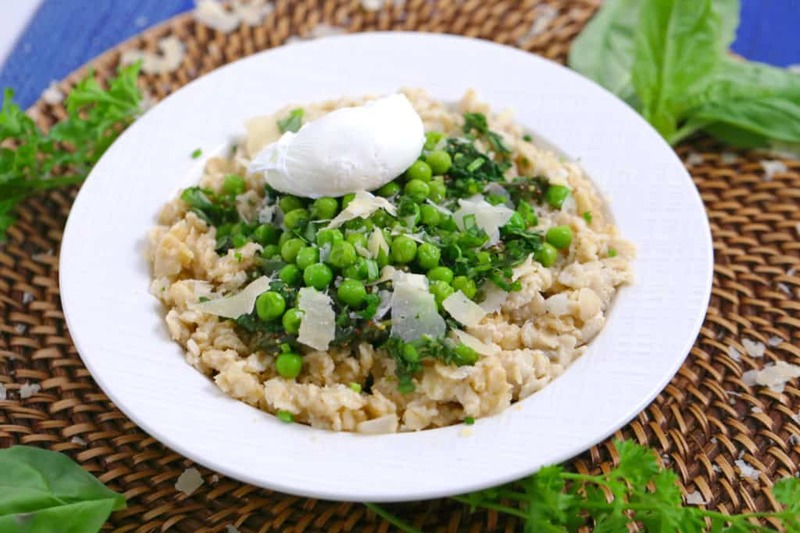 Serve warm oatmeal with a poached egg and enjoy! *Watch the full process to see how it’s done in my Savory Oatmeal video! 1. 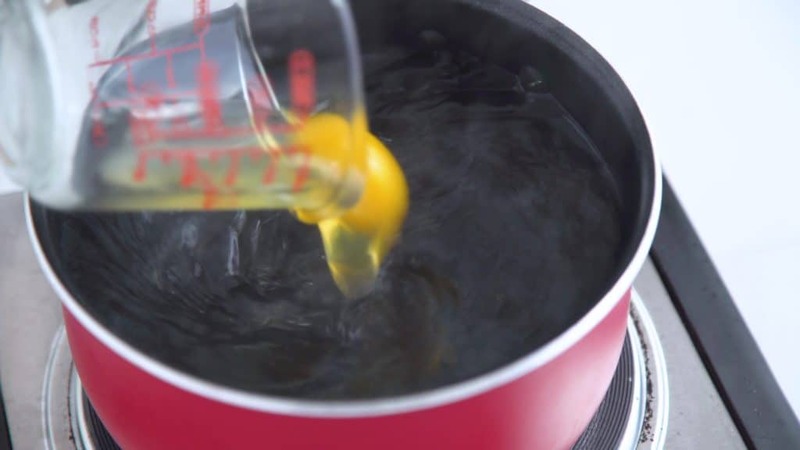 Crack egg into a measuring cup (or a cup that’s easy to pour from) to make sure the yolk isn’t already broken. Set aside. 2. Fill a large pot just over halfway with water. 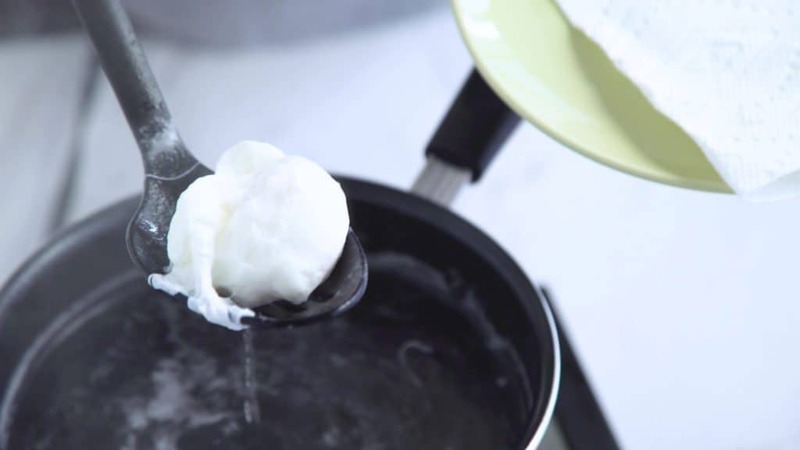 Bring to a light boil over medium heat—VERY light, just so the bubbles are coming up the sides of the pan but not rolling. 3. Add salt and white vinegar and stir to integrate. 5. 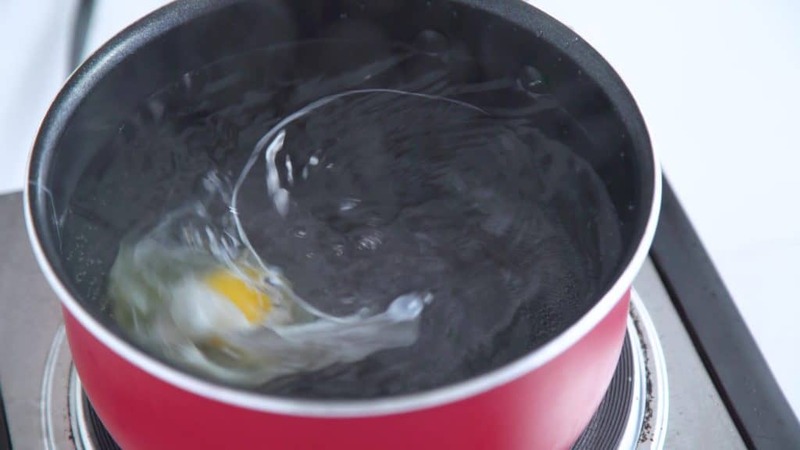 Once you have your whirlpool swirling, quickly pour your egg into the center and let the whirlpool work its magic. 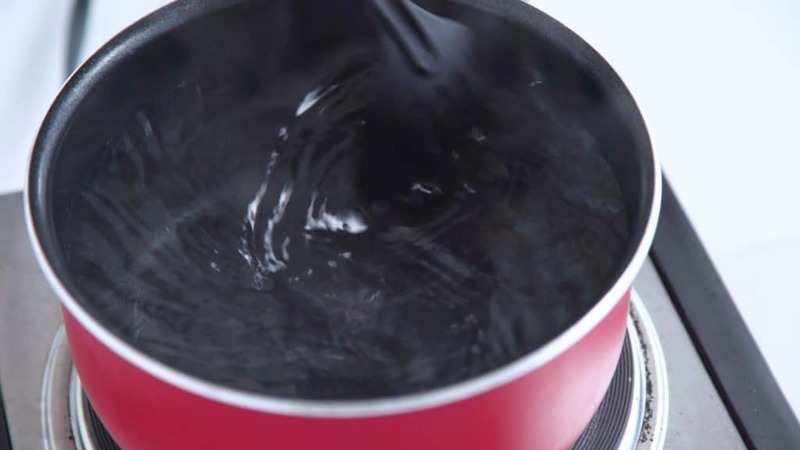 The whirlpool WILL slow down and eventually stop, which is fine—gently use your spoon to occasionally move the egg, so it doesn’t get stuck to the bottom of the pot. 6. Watch your egg as it cooks, making sure not to leave it too long. 7. For a poached egg that’s ‘over-easy’—with a warm, runny yolk and set whites—I find that about 2½ minutes works perfectly. If you like your egg cooked even easier, go for 2 minutes. If you prefer a set yolk like an ‘over-hard’ egg, cook just over 3 minutes. Remove when cooked to desired doneness! 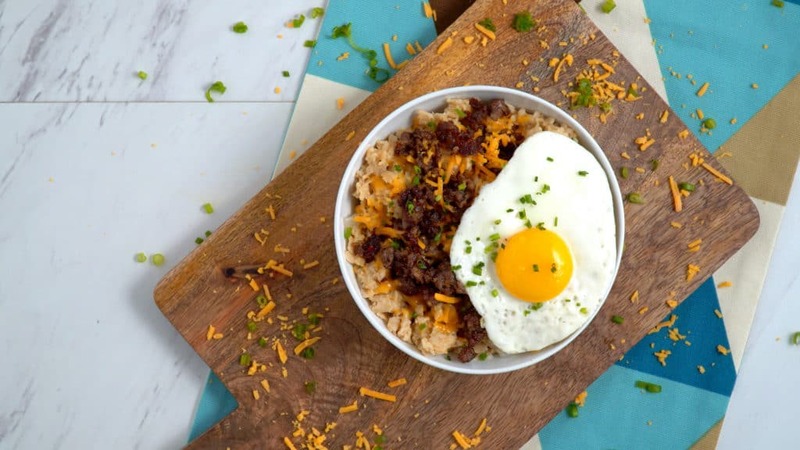 Now you can enjoy two breakfast classics in one bowl: sausage, egg & cheese, served over savory oatmeal! Because why choose just one when you can have both? A meaty, cheesy breakfast mash-up that’s sure to satisfy. Plus, you’ll devour a whopping 19 grams of protein per bowl! Cook sausage and fry egg as desired. Add all toppings to savory oatmeal base, serve, and enjoy! 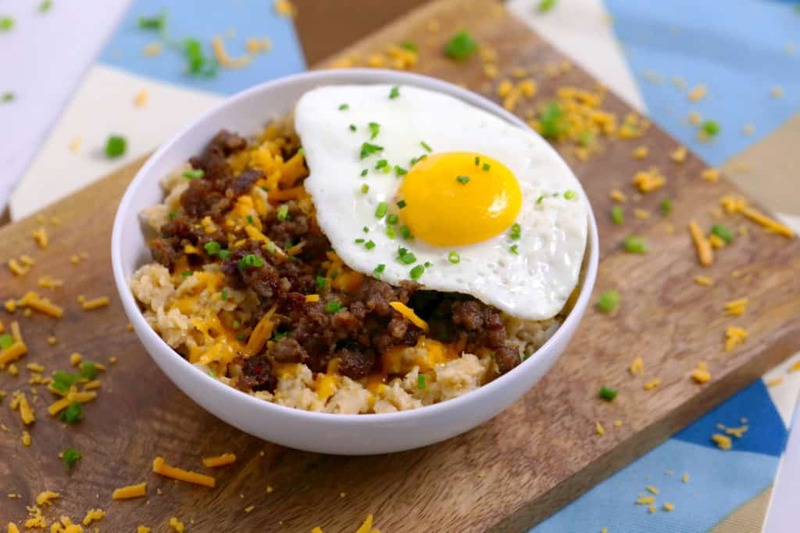 Warm oatmeal meets hearty breakfast hash in this sweet & savory bowl! 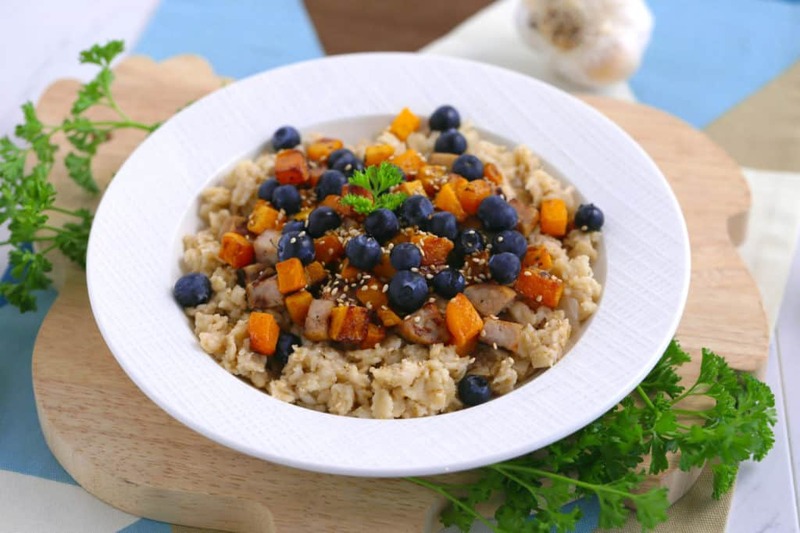 Butternut squash and blueberries are a refreshingly sweet duo that complements the savory sausage and oats perfectly. Scrumptious, simple, and with a healthy balance of protein, fat, & complex carbs! Roast butternut squash cubes at 425°F (220°C) for 30 minutes. In a pan over medium-high heat, char chicken apple sausage (if desired). Add sesame oil to cooked oatmeal and stir to integrate. Add remaining toppings, finish with a sprinkle of sesame seeds, and enjoy! Sauté onions and mushrooms long enough, and their natural sugars caramelize to make them even sweeter! Paired with the rich, umami bite of goat cheese and buttery crunch from the pine nuts, this savory breakfast is bursting with indulgent flavor, fun texture, and nutritious fuel. In a pan over medium heat, drizzle a bit of oil and add onion and mushrooms, seasoning to taste with salt and pepper. Turn heat to low and sauté 20 minutes, until tender and caramelized. Set aside. Add remaining toppings, serve, and enjoy! You can enjoy tasty taco flavors and fixin’s in SO many different ways—even over a bowl of savory oatmeal! Stir taco seasoning into your oats for a zesty base, then load it up southwestern style. I went with corn, salsa, cheese, avocado, and jalapeño slices, but get creative with your favorites! *Omit shredded cheese for Vegan & Dairy Free. Stir taco seasoning into warm savory oatmeal base. Add toppings to oatmeal, finishing with a squeeze of lime juice and a sprinkle of chopped cilantro. The natural sweetness and umami flavor of curry powder is as delicious with oats as it is with other grains! 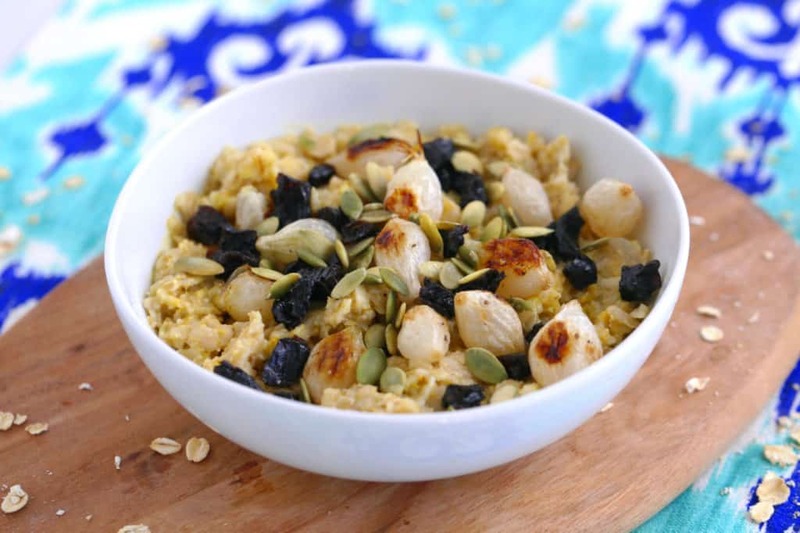 Maximize that flavor contrast in your savory oatmeal with some sweet, chewy diced prunes and roasted pearl onions on top, plus a sprinkle of pumpkin seeds for a satisfying crunch. 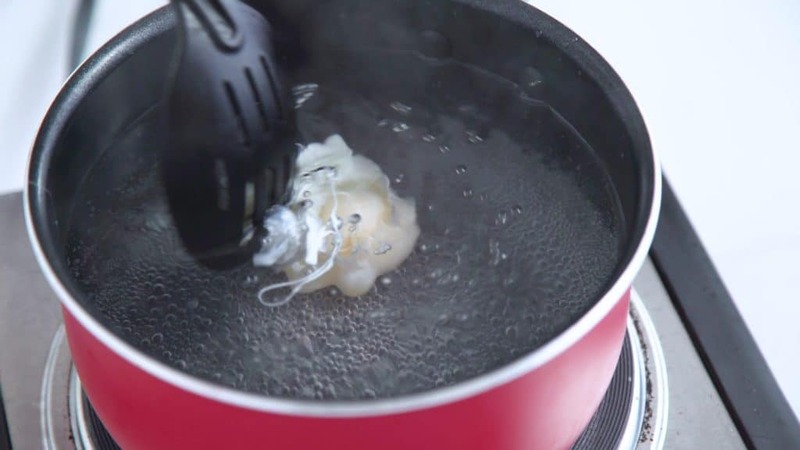 Roast frozen pearl onions at 400°F (200°C) for 20-25 minutes. Stir curry powder into warm savory oatmeal base. Add all toppings to oatmeal, serve, and enjoy! Spice up your morning with a zesty zing of ginger and sriracha! Coconut milk makes these oats ultra-creamy and helps to mellow the heat. Between the salty soy sauce and peanut butter, plus some crunchy peanuts on top, this flavor-packed breakfast is just weird enough to work! Yield ~4 cups cooked oatmeal. Add 1 cup cooked ginger coconut milk oatmeal (or basic savory oatmeal, if preferred) to a bowl. Stir in soy sauce and peanut butter. Same procedure as original savory oatmeal base, but with addition of fresh ginger and using coconut milk instead of broth/water. In a pot over medium-high heat, drizzle oil and sauté onions, garlic, and ginger until tender and fragrant. Add coconut milk and add salt. Cover and bring to a boil. Yields ~4 cups cooked oatmeal. 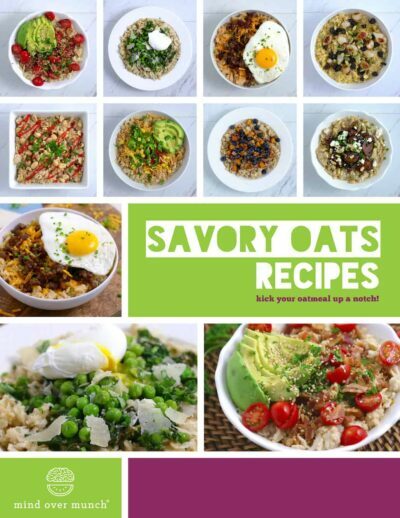 FREE Savory Oatmeal eBook Download! To get all of the savory oatmeal recipes from this post as one file, click to download my FREE Savory Oats Recipes eBook!